"Those of us who have been focused on designing for mobile have done our job a little too well. We've created experiences that are too engaging, that pull us away from the people and places we care about." That's the opinion of Josh Clark. He's the head of design at Big Medium, a boutique design agency that specialises in internet of things experiences – and he also found time to mastermind the ubiquitous Couch to 5k programme back in the 90s. 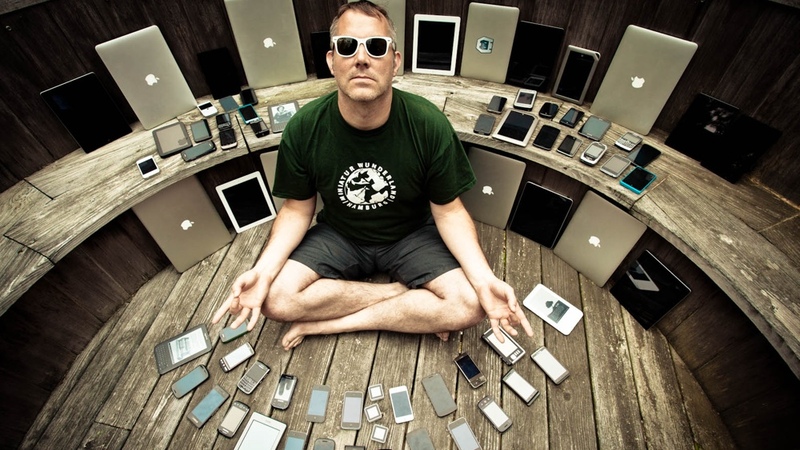 What brands and designers really mean when they say "engagement" is really "theft of attention"
Clark has been designing mobile interfaces for years and is now focusing his attention on what's coming next: the era in which "the entire world becomes a digital interface". He's talking about the internet of things; as sensors and processors become so inexpensive they can be put anywhere and everywhere. Designing how we interact with this landscape of devices, and how they interact with each other, is his thing. And one of Clark's obsessions is how we make design decisions to manage the overwhelming amount of data that now surrounds us. "On average, we spend 3 hours and 15 minutes looking at a smartphone screen everyday," he explains. "As much as smartphones have given us, they've also taken away. The more connected we are, the more disconnected we seem to be." For Clark, the role of the smartwatch is to enable us to "skim the surface of our personal data" as opposed to the long Twitter sessions that we might get into on our phones. "We can dip into the watch screen to get what's urgent without getting distracted," he says. As we move toward an era in which we're surrounded by interfaces that sit in the environment as well as on our bodies, "the real luxury will not be more data but less, delivered in a thoughtful and respectful way," says Clark. And for Clark, adding another screen to our digital armoury isn't just unnecessary, it's counter productive. "We don't have to wedge a screen between the world and us. The physical world is already a wonderful interface, and the idea of wearables and the internet of things should be to let that interface be even more expressive." In Clark's view, we should limit the number of computers and "smart things", but give those devices more sensors—both in the environment and on our bodies. He's also keen on augmenting our surroundings with more opportunities to interact. "The most straightforward example is the wave of connected buttons we're seeing bt.tn, Flic, Amazon Dash," he explains. "These are simple, single-action interfaces – push a button – that triggers action in the digital world (call a taxi as I leave home, order coffee when I run out, text my family that I've arrived home). The opportunity that we have is to create familiar physical interfaces to digital systems – no screen even necessary." In Clark's view, if we can trust our devices to let us know when something really is important we can disconnect from our data feeds. Don't approach the problem like Google Glass engineers: "Hey, we have this list of hardware components; what happens if I strap them onto your face?" "As we move interactions into the physical world and off of screens, I hope that means we can let go of our dysfunctional obsession with engagement. What brands and designers really mean when they say "engagement" is really "theft of attention." The exciting thing about smart watches is that they emphasise glanceability instead of engagement. It's not about long sessions. It's about delivering the right information quickly and at useful moments – and then letting you get back to your life in the real world. "That should be the goal of our interfaces: speak only when relevant, and then pipe down. We have better things to do than lose ourselves in our screens." He sees the future of the smartwatch as being something similar to the Magic Bands that Disney uses at its theme parks; wristbands that unlock doors, order your meals and make payments happen instantly. For that to happen we need to convince a lot of people to wear them, and we're not quite there in terms of technology, but there are many exciting things that can be done with what we have now. "Think about the gestures you might be able to use to drive your phone or its relationship to your computer. Snap your finger or wave your hand to play music or trigger some other action. Its shifts the point of interaction to your body. When you say a word and make a gesture with your smartwatch hand, that's Harry Potter stuff. We're equipping ourselves to communicate with the unseen world, the digital realm. This is going to get interesting." At this point in time, Clark notes that it's important we reimagine our relationship to technology, to bend it to our lives instead of the reverse. "For hardware designers, that means a focus on creating beautiful objects. Don't approach the problem like Google Glass engineers: "Hey, we have this list of hardware components; what happens if I strap them onto your face?" Instead, create something gorgeous that I would want to wear even if it didn't have superpowers. And then ask: 'How can I make this beautiful object not only smart but magic?'"